Marana Rotarians began today’s meeting against the backdrop of a spectacular Arizona sunrise, to which we sang a rendition of Jingle Bells. President Mary Straus opened the meeting with announcements – the first of which was from Harold Burtzloff. The packages sent from Boxing for Troops have arrived in Afghanistan! Harold thanked everyone for helping out, in one way or another, with this project. He also announced our next Fifth Tuesday social at Café Torino (see Calendar Update below). Honorary member Kathleen Neighbors presented Mary with the actual check for $100 from the Tortolita Interact Club. The Club’s salsa sales at the Tortolita winter festival were very good – they sold out! 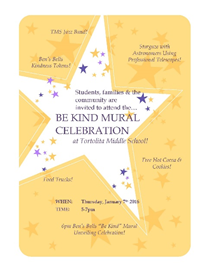 And Kathleen invited everyone to the Be Kind Mural Celebration at the school on Thursday Jan 7, 2016, from 5 to 7pm. The Ben’s Bells “Be Kind” mural will be unveiled at 6pm. 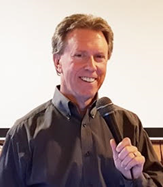 Don Jorgensen gave a lively update on his experiences shopping for Thanksgiving and Christmas for the family-in-need we chose to help out this year. Vanessa Ruiz and Randy Brooks had really taken the reins on the project, Don said, taking it upon themselves to catch, subdue, and slaughter a turkey. Not as easy as it sounds (?) according to Dr. Jorgensen, particularly in the Pilgrim clothes they were wearing at the time. Conjures up an interesting visual. Perhaps next year we could get Randy to pardon the turkey? At this point, John Dooling was moved to relate an obscure turkey-related quote from W.C. Fields. None of us were sure what to do with that. At any rate, Vanessa, Randy, and Don purchased and delivered food and presents for our family-in-need, all within budget. Well done! Our morning meeting is replaced with an evening social, at 5:30pm Café Torino, 10325 N. La Canada in Oro Valley (the southwest corner of Lambert & La Canada). Unveiling of the Be Kind mural at Tortolita Middle School. Don Jorgensen announced that our Club needs three host families for next year’s Rotary Youth Exchange. There then ensued a general discussion on how much previous host families enjoyed hosting a student. Everyone agreed that this was a most rewarding experience in which life-long relationships are formed. Mary added that, from a larger perspective, Youth Exchange is really all about world peace, and helping to make the world a smaller place. Don asked that anyone having any questions about Youth Exchange give him a call or send an email. 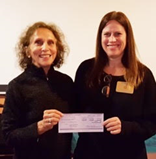 Mary has been working on designing and funding a playground for special needs students at Coyote Trail Elementary school, along with Mellodie Stratman, Special Education and Bridge teacher, and Jo Holt. Today Mary reviewed the project with a PowerPoint presentation, and we learned two new words: vestibular and proprioceptive. Vestibular responses are those originating with the inner ear, while proprioceptive responses involved joints. The development of these responses is critical to special needs children. Although most of the funding is in place for the playground, there are still several hurdles to overcome. The purchase of a wheelchair-accessible swing continues to be problematic, the primary issue being one of safety, which has been the focus of many discussions. Mary, Jo, Mellodie, and MUSD officials (including safety officer Dan Contorno) will carry on with fingers crossed.